The hackers' collective Anonymous had a year full of headlines and trending hashtags in 2015. This was the year when the shadowy group seemed determined to make its mark by going after a target that people could universally rally against: ISIS. After "Charlie Hebdo" and November's Paris terror attacks, Anonymous staged social media "Ops" designed to disrupt and upstage the terrorist group. Other efforts this year included targeting Republican presidential candidate Donald Trump and unmasking potential KKK members -- provocative attention-grabbers that didn't produce much in the way of tangible outcomes. The group also made some very public missteps. Whether a hit or miss, Anonymous indisputably became a big newsmaker of 2015. In January, the world was rocked by attacks that killed 12 people at the offices of satirical French newspaper "Charlie Hebdo" and four more at a kosher supermarket in Paris. The following day, Anonymous released a video on YouTube showing a masked figure reading out an ultimatum of sorts to the terrorists. "We are fighting in memory of those innocent people who fought for freedom of expression," the figure said in the video. Flash forward 10 months later, and after the terrorist attacks that killed 130 people and left hundreds wounded, Anonymous announced its second online assault. Using the hashtags #OpISIS and #OpParis, the group rallied its digital troops and declared "war" on ISIS. In the face of these kinds of social media campaigns, the question that kept coming up was: Just how effective is this? Anonymous hackers claimed to have taken down some 20,000 Twitter accounts used to propagandize and recruit for ISIS. But for many social media-watchers, Anonymous's efforts against ISIS seemed to devolve almost immediately from the concrete to the abstract. ISIS supporters could reopen accounts under new handles or communicate through other secure apps. "You look at what is happening with this current iteration (of Anonymous's operations) and you see that it doesn't have much of an effect, which has nothing to do with Anonymous, per se, and more to do with the fact that ISIS has grabbed and secured global media attention in so many channels," Gabrielle Coleman, Wolfe Chair in Scientific and Technological Literacy at McGill University in Montreal, told CBS News following the Paris attacks. "#OpISIS (which followed 'Charlie Hebdo') had a better track record as opposed to #OpParis because they had been at it longer and that was a smaller team of people." About a month later, Anonymous declared Dec. 11 "Troll ISIS Day," calling on people to flood social media with posts mocking the terror group. 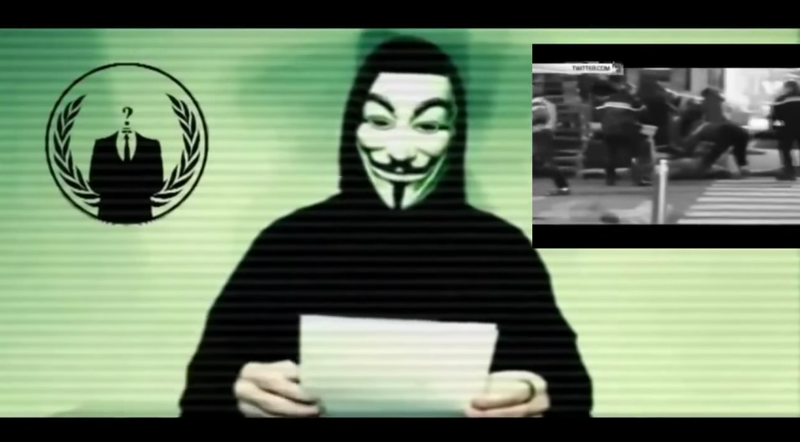 You didn't have to be an outlaw hacker to fight ISIS online -- Anonymous encouraged everyone to join in. "Do not think you have to be a part of Anonymous, anyone can do this and does not require any special skills," the group said in an online post to ghostbin.com. The day was meant more as a way to satirize ISIS than anything else. Average Twitter users weren't going to take down ISIS operations with a 140-character message or comical meme. Unfortunately -- as is often the case with Internet campaigns -- it devolved into some culturally insensitive posts that were inflammatory in their own right. "You know there are a lot of people within Anonymous who were excited about and also dreading it (Troll ISIS Day). They were dreading it knowing that a lot of material would be offensive to Muslims," Coleman said. "One of the things I'm looking out for are memes and images that set out to truly offend ISIS itself and not Muslims as a whole." Anonymous has a history of going after larger-than-life figures and organizations that offend its sensibilities. One prominent target a few years back was the Church of Scientology, which Anonymous hackers spammed with email and "Google bombed," rigging search engine results to generate the phrase "evil cult" whenever someone looked up Scientology online. So perhaps it should come as no surprise that the hackers would look to one of the most provocative personalities in the 2016 presidential election as a juicy target. Following Republic front-runner Donald Trump's controversial proposed ban on Muslims entering the United States, Anonymous declared #OpTrump as a way to undermine and critique the candidate online. Not long after the group's YouTube announcement of the campaign, Reuters reported that Trump Tower New York's website was temporarily down. While an Anonymous-associated Twitter account claimed responsibility, the site was back up shortly. Less widespread than the campaign against ISIS, the Anonymous effort to go after Trump seemed to generate a lot of initial interest before sputtering out. About a month before it ramped up its war agains ISIS this fall, Anonymous went after another much-reviled group -- the Ku Klux Klan. Hackers released the names of 1,000 alleged members of the white supremacist group online, culling the information over a period of 11 months with the help of some KKK members who fed information to the collective, ZDNet reported. This information dump followed a controversial leak a few days earlier by a lone hacker that quickly prompted a backlash. The initial list of names included unfounded accusations against a number of individuals including Lexington, Kentucky, mayor Jim Gray, who denounced the list as "false, insulting, and ridiculous." It also exposed a rift within the Anonymous collective, as a Twitter user claiming to speak for OpKKK criticized the leak. "We believe in due diligence and will NOT recklessly involve innocent individuals," the tweet said. In releasing the final list, Anonymous expressed hope that "Operation KKK will, in part, spark a bit of constructive dialogue about race, racism, racial terror, and freedom of expression, across group lines." "We consider this data dump as a form of resistance against the violence and intimidation tactics leveraged against the public by various members of the Ku Klux Klan group throughout history," the hackers added. The critiques against the leaked list exposed some of the flaws behind these kinds of decentralized social media movements, especially when information shared could get into potentially libelous territory. And while the KKK, like ISIS, is an easy target to rally against, in the past, some Anonymous operations have been morally murkier. In 2012 it went after the U.S. Department of Justice, the FBI, the Motion Picture Association of America (MPAA) and the Recording Industry Association of American (RIAA) in retaliation when the online file-storage and sharing site Megaupload was taken down. Anonymous' stand for unfettered digital sharing ran into opposition from many who valued copyright protections. In 2014, Anonymous hacker-turned-FBI informant Hector Monsegur explained to "CBS This Morning" co-host Charlie Rose the allure of being part of the group. "Anonymous is an idea," Monsegur said. "An idea where we could all be anonymous. We could all work together as a crowd -- united -- we could rise and fight against oppression." Just a quick search through Twitter with the hashtag #Anonymous turns up countless daily posts from around the world connecting over this idea of working together. Despite shortcomings revealed by some of its recent operations, Anonymous still has widespread appeal, and after its publicity splash in late 2015 it may have more name recognition than ever. In describing the group to CBS News, cyberwarfare expert David Gewirtz said Anonymous's actions can have a positive impact, but can also be hard to predict. "Anonymous, while itself something of a vigilante organization, can pick enemies we also see as enemies," he said. "But they tend to knee-jerk reactions that might have unintended consequences."